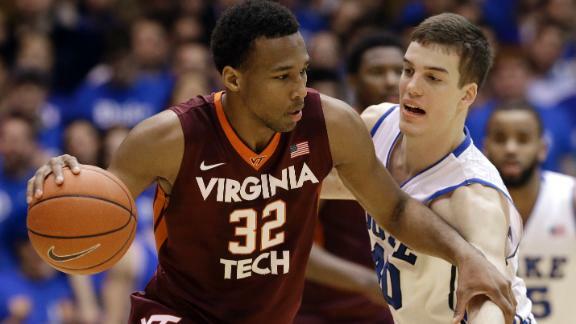 Ohio State has landed Virginia Tech transfer Trevor Thompson. Thad Matta and the Buckeyes added Temple transfer Anthony Lee, who will be eligible this season, last month and now have added Thompson, an athletic, promising 7-footer who also was courted by Indiana, Purdue and Butler. "I love the academics, the fans, my new teammates and the coaching staff," Thompson said. "It was the perfect fit." Thompson averaged 5.0 points and 4.7 rebounds per game as a freshman, but went for 15 points and grabbed six rebounds at Duke in February -- and showed potential of being a big-time player. Thompson likely will sit out next season at Ohio State, but there is a chance he could request a waiver from the NCAA -- due to his father's medical condition -- to see if he could play in 2014-15. Thompson is an Indianapolis native and the son of former Major League Baseball player Ryan Thompson. ESPN College Basketball Insider Jeff Goodman discusses what it means for Ohio State to have landed Virginia Tech transfer Trevor Thompson.